Breakfast is one of my favorite genre of recipes but unfortunately, with early morning school schedules, I don’t get to making a delicious fresh out of the oven breakfast as often as I would like to on school days. 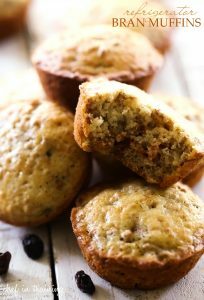 That is what is so special about today’s recipe for Refrigerator Bran Muffins is so special. I have another delightful recipe that comes from my grandma’s cookbook to share with you today. She has been using this recipe since my mom was a little girl. Believe me when I tell you there is a reason they are still being made today. They are DELICIOUS! Seriously some of the best muffins out there! The texture, flavor, pretty much everything about them is fabulous. Did I mention they are healthy, too? 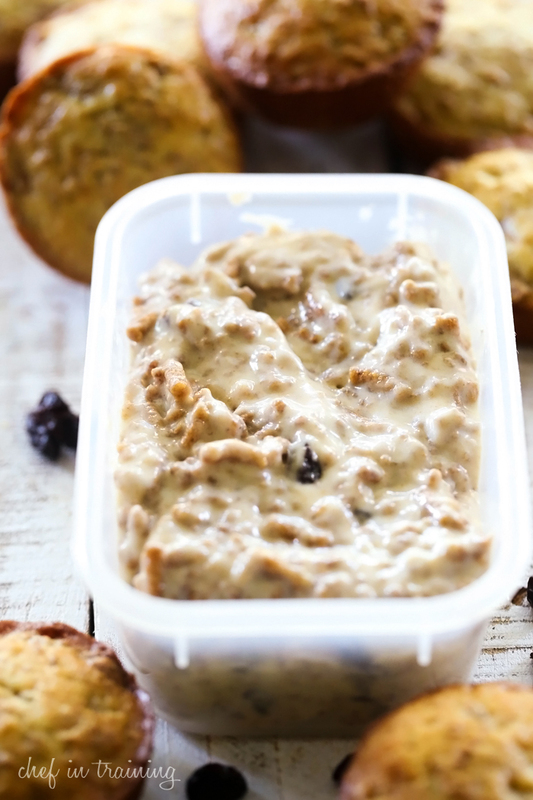 You can make this recipe and store it in an airtight container in the fridge for up to 6 weeks! Just preheat the oven and dump some batter into the muffin tin. Easy Peasy! And you have a fresh cooked warm breakfast for the family. This recipe is ALWAYS a good thing to have on hand! It never makes it the full 6 weeks at my house because frankly we just can’t stop eating them! This recipe can last up to 6 weeks in the fridge and is ALWAYS a good recipe to have on hand! It makes delicious muffins with the perfect texture! They will never make it to 6 weeks with how fast they get gobbled up and requested! In a small bowl pour boiling water over bran and let sit. In a large mixing bowl cream sugar and butter. Add eggs and beat. Add buttermilk. Add flour, soda, and salt. Mix in bran, raisins, and Grape nuts. Store dough in an airtight container in the refrigerator for 6 weeks. I've never heard of a dough you can keep for 6 weeks in the fridge! I freeze my cookie dough and pie dough and things like that and can keep it for 3-4 months in the freezer but never in the fridge and never for a muffin or cake. This is truly news to me!! Must try & pinned! I use to make this quite often in earlier years. It works. I lost my recipe so happy to see it here. This sounds so good. Going to fix a batch for my friend cause she is a bran and raisin person. Can u tell me what is half and half pls also what is soda and how can i make butter milk thanks. Sharon -- half and half is something you buy at the grocery store in a carton, it is half cream and half milk. You could probably just make your own if you couldn't find it. Buttermilk is also sold in a carton in the dairy section, you cannot make it, it is the byproduct of making butter. Soda refers to baking soda, usually packaged in a box, found in the baking section of the supermarket. my neighbor, elderly, always has these available - though it was just her thing. they are good. When I first noticed the details of this recipe and how it could be kept in the refrigerator I became really excited, that is until I actually read the ingredients. Oh I still love the recipe and I'm going to share it with family and friends because I think quite a number of people could find this handy, especially in the morning as something quick to fix while trying to rush out that door, but I was so disappointed because its going to be SO hard to make a gluten free version of it. . Any recipe I find that I like I have to find a way to make it gluten free. As long as it uses regular flour it's fairly easy to do but with the addition of the two cereals, both gluten cereals and especially the Grape Nuts which is very unique, this is going to be very difficult to "de-glutenify". (yes, I just invented that term). If anyone knows of a recipe or anyone who does have a gluten free version of this recipe or one very similar to it I would just love to have it. As I have fairly bad fibromyalgia (now believed to have been caused by a lifetime of consuming gluten and having dormant Celiac Disease which did not rear its ugly head until about the age of 40, mornings are difficult and can be slow to get started and moving. I happen to be one of those people who just LOVE a pastry or a baked good for breakfast with my coffee or tea. It's not unusual for me to have a piece of pie or even cake for breakfast. The way I look at it is that it can't be very different than a donut, a cinnamon roll, a sticky bun (one of my ALL time favorite things), or any other pastry like that. Unfortunately though its always more work when I discover one because I have to find the non-gluten version of it and sometimes they don't taste quite the same. I wish the medical world would spend as much time finding a CURE for both Celiac Disease AND Fibromyalgia as they do some others, the lives of millions would be normalized. We called these 6-week muffins. We took the batter on RV trips and ate them for breakfast, snacks, and whenever we wanted them. Dan you determine the total carbohydrates for a single muffin since this makes 36? This recipe seems like it would be some what healthy. How many muffins does it make? Do you fill the muffin time 3/4 full?